This morning I was a very happy little polar bear. 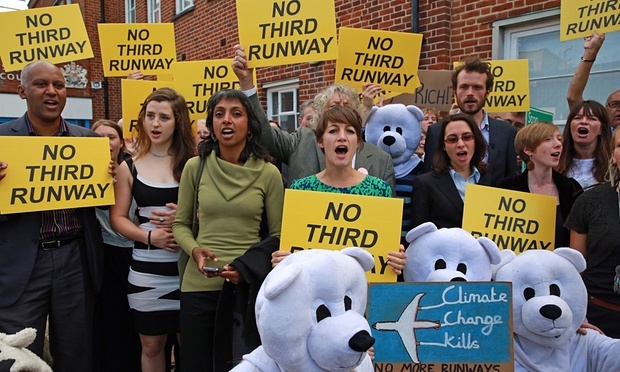 “No ifs no buts, no third runway” we shouted. Standing outside Uxbridge Magistrates Court with forty other people I supported the climate activists who were arrested last month protesting against airport expansion. The 13 brave folk pleaded not guilty to aggravated trespass because of the greater climate crime they are trying to prevent. You can watch a video of Sheila’s statement that she read outside the court. Check out my happy polar bear protest sign. Don’t want to wait for a paint to dry? Try chalk, tipex and hairspray instead. The UK climate targets will only be met if we do not allow airport expansion. The vast majority of flights in this country are from a small minority of very frequent short haul flyers. For example those with second homes who fly to them at weekends. Policies such as stopping frequent flyer discounts and introducing a frequent flyer tax would help us reduce, not expand airports. No ifs, no buts, no more runways.